A massive expansion in the baby boomer population creates an increasing need for adequate care for those who are elderly or disabled. Indiana always has a need for professionals who specialize in the care of the elderly. Adults who enroll in certified nursing assistant programs find immediate employment, filling new vacancies and replacing positions left by those who move into other careers in healthcare. Older CNAs are also retiring, which creates a greater need for younger ones to take their place. CNAs are in high demand in long-term care. They help seniors and disabled residents with eating, dressing, and bathing and provide support with mobility and other day-to-day activities. They take vital signs, monitor patients response to treatments, and report concerns to a registered nurse. All of the CNA’s activities are completed under the supervision of a licensed nurse. Due to the high workforce demand, most nursing assistant students secure employment before they graduate. Another important factor that influences demand for CNAs is the high turnover rate in the industry. The duties of a CNA’s job are physically demanding. 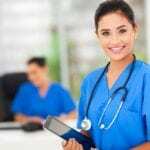 The physical demands and lower-end salary lead many to pursue other aspects of patient care, such as medical assisting, licensed practical or registered nursing, and home health care. According to the federal Bureau of Labor Statistics, the number of CNA jobs is projected to grow by 17 percent between 2014 and 2024, which is faster than the average for all occupations. This projection translates to almost 267,800 new jobs to fill the needs of aging baby boomers. The median CNA salary for nursing assistants in Indiana is $25,000. Out of the estimated 30,900 employed in the state, half of them earn more than the median and the rest earn slightly less. Miller’s Merry Manor provides free Certified Nursing Assistant training for adults interested in becoming a CNA. The program is approved by the state so graduates are eligible to take the state certification exam to be added to the Indiana Nurse Aide Registry. The curriculum covers 36 to 40 hours of lectures and demonstrations in the classroom and 75 hours of supervised practicum in a long-term care facility. Students must pass the classroom portion with a score of 80 percent on all tests – students are given 3 attempts to pass. Those who do not pass the classroom portion will not be admitted to the clinical component of the program. The first 16 hours of the practicum experience will be conducted under the direction of the class instructor. Student will and must perform all the required skills. Absenteeism during this time will result in dismissal from the program. Following the initial 16 hours, students will be assigned to a preceptor who will assist with organization and time management. The preceptor, along with the instructor, will also evaluate students’ progress at the conclusion of the clinical. Full attendance is mandatory to meet the requirements for graduating from the program. Unsatisfactory performance and poor attendance will result in dismissal from the program. Graduates will be scheduled for the state exam, which will be paid for by Miller’s Merry Manor. Textbooks will be provided on loan and cannot be removed from the facility. The CNA program at Freedom Academy includes classroom and clinical experiences to prepare students for success on the state certification exam. In the classroom, instructors cover vital signs, anatomy and physiology, medical terminology, safety and emergency procedures, communication and interpersonal relations, infection control, Alzheimer’s care, feeding and nutrition, personal care and grooming, patient hygiene, patient rights and independence, and hospice care. A clinical practicum will give students the opportunity to apply their skills in a real-world setting. When combined with the theory, the practical experiences prepares students to provide basic care to patients in extended care facilities, hospitals, and other health care settings. Graduates will know how to follow proper safety regulations, report incidents, and meet patients’ needs. They will be eligible to take the State Department of Health exam to be added to the State Nurse Aide Registry. Persons interested in enrolling in the program should visit Freedom Academy to collect the paperwork for admission. Full attendance is required to complete the program. Century Career Center facilitates a nursing assistant program that gives high school students in grades 9 to 12 the opportunity to explore a career pathway in health. Students will earn college credits and will have the unique opportunity to participate in industry internship while in high school. Graduates will receive a certificate of completion and will be eligible to take the state certification exam to be added to the Indiana Nurse Aide Registry. 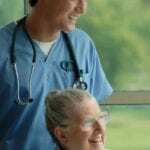 The CNA preparation curriculum includes classroom theory and a clinical practicum at a long-term care facility. Students learn medical terminology, health safety and nutrition, laws and ethics, rehabilitative and restorative techniques, infection control, the role and responsibility of the nurse assistant, range of motion, safety and emergency procedures, and measuring vital signs. Students will also learn how to transfer patients from the bed to the wheelchair and back again, position and turn patients, respond to call lights, observe patients and report concerns, assist with treatments, and bath and dress patients. A background check, physical exam, TB clearance, and immunizations may be required for participation in the clinical practicum.